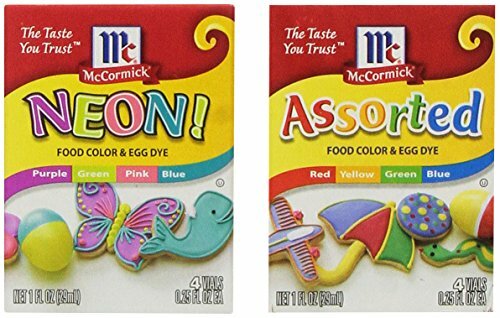 Assorted Food Coloring includes: A box of four color solutions, Red, Yellow, Green & Blue, used for coloring foods and dyeing eggs. Assorted Neon Food Coloring includes: A box of four intense color solutions. Purple, Green, Pink & Blue, used to color food and dye eggs.